Every brand requires a clear message if it’s going to succeed. 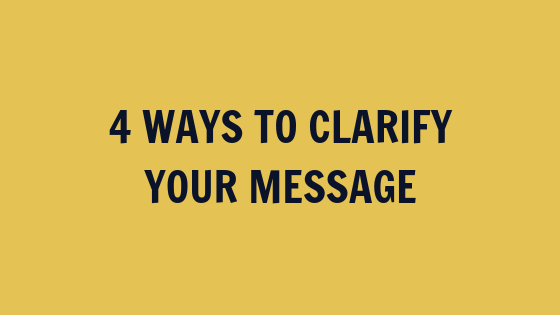 If you don’t clarify your message, it won’t be understood or seen, which means your business won’t grow. We refer to this clear message as your North Star. It’s the guiding light that helps you determine what to say, how to say it, and when to say it. It’s what allows you to build a bridge between yourself and your audience, become a leader in your field, and scale your business. And whether you realize it or not, you have a message. Just by existing, you’re putting a message out to the universe. And that, my friend, is important to understand. Because while you can’t help having a message, you can put some intentionality around it. Every brand, whether it’s a personal brand or a big corporate brand, has a North Star. And that North Star is comprised of four key elements that, when looked at strategically (and re-examined periodically) allow you to create a business that thrives. When asked what mission drives your business, you may be tempted to respond with your mission statement (if you have one). In reality, your mission statement is only part of it — it’s the pithy, one or two sentences that put your mission on paper. But the mission itself? That runs deep. That’s a part of your culture. When you talk about the mission of your company, you’re looking at the deep, constant “why” behind your brand. This is your business’ reason for existing, and it’s a reflection of the values you support as a business. As soon as you’re clear on your mission, you can begin speaking to it in your content. Your message is largely driven by turning your mission into a reality. For example, if your overarching mission is to improve access to healthcare, then everything you say and do can orbit around that singular focus. What is the single most important function of my business? When people think of my brand, what do I want them to picture? What core values are represented by my business? Your mission is inseparable from your audience. The people you serve are helping you fulfill your mission. To make this happen, you need to know, intimately, who those people are and how you are helping them. When you aren’t clear on who your audience is, you can’t easily speak to them. Your job, when creating your message, is to build a bridge between your brand and your audience. That bridge is comprised of a common language, relatability, education, value, and the offer of help. The more clear you are on your audience, the better. This is particularly important, because over time as your business grows your audience may shift. Be sure to check in periodically to see if your audience has evolved. In doing this, you create a message that your audience can connect to. You’re able to build a brand word bank, understand their language, and create content that speaks directly to their frustrations (and how you can alleviate them). What is the primary frustration or problem my audience has (that my brand is aiming to fix)? What qualities do my best customers/clients share? What would disqualify someone from working with my brand? Where your mission focuses on the now, your vision looks to the future. This isn’t just a fun “What if?” activity. It’s an opportunity for you to intentionally look at where you want your brand to go. When you’re clear on your trajectory, it becomes a simple matter of working backward. For example, if your mission is to reduce illiteracy in urban areas, and your audience consists of inner-city parents and schoolteachers, your vision paints a picture of how your work will look in the long term. Will your brand be sponsoring literacy events? Will it be recognized in one specific urban area, or in cities across your country? Will you be the face of your brand, taking to stages and workshops to help teachers? Or will you have a group of trained experts to spread the message? Once you’ve answered these questions (you can start with the ones below) you can begin to shape your message around your vision. If you intend to eventually eradicate illiteracy on a global level, include that in your message right from the get-go. What impact do I want my brand to have on my community/industry/world? In what way will my brand ultimately interact with its customers/clients? What role will I play in my brand’s work? The final piece to the messaging puzzle? Your content pillars. These are the 2-3 topics that build the foundation of your content. Often, we fall into the trap of creating a lot of content about a lot of different topics. The problem with this is that it can confuse our audience. It’s far better to be really good at talking about a few topics than to be mediocre at talking about a bunch of different things. Take stock of your content periodically, and don’t be afraid to look at it through the lens of your mission, audience, and vision. You may need to periodically delete, rework, or refine old content, and that’s okay. The good news is that, with only a few main topics to focus on, you can create a powerful content strategy that requires minimal effort and shares your message across multiple channels. If I broke my mission into 2-3 subtopics, what would they be? What content do I already have that serves these 2-3 subtopics? What new content can I create to fill gaps (or what content can I delete to erase confusion)? As our business grows and changes, these elements may change slightly. That’s okay — it’s normal. Odds are they won’t alter drastically (unless you pivot or start an entirely new business). That said, almost every business endures a micro pivot or two, and even if it doesn’t, it’s important to have a pulse on where you stand. Here’s an easy way to remember the four elements you want to evaluate periodically: VAMP. Vision. Audience. Mission. Pillars. If you remember VAMP, you’ll remember where to check in on your message. In musical terms, “vamp” means to repeat something. Your brand’s North Star — its VAMP — is something you will come back to, time and time again, refining it as you shift and grow. 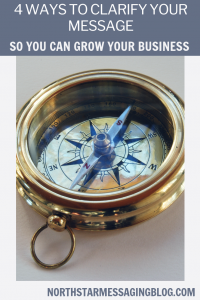 Once you hone in on your North Star, it becomes a guiding light for everything you do in your business. It creates a strategic pathway to a more successful business. Do you know your VAMP? Let us know in the comments! Skip the DIY and get personalized copywriting support! We help personal brands and service-based businesses create a clear, consistent message. Whether you’re prepping for an upcoming launch, rebranding, or trying to build your list, we can help. Submit an inquiry form to get started!